If Hollywood ever decides to make “The Easter Bunny,” with Vin Diesel, chances are that director Michael Lembeck will be on the top of the list of possible helmers. In another fantastical follow up to his directorial turns on the second and third installments of the successful Tim Allen franchise The Santa Clause, Lembeck delights audiences with this unsurprising yet benign and family friendly yarn in the tradition of Clause as well as Diesel's The Pacifier and Tooth star Dwayne “The Rock” Johnson's first breakout kiddie hit, The Game Plan. Similar to Clause, the movie finds a cynical man's man given a dose of sugar coated fantastic reality when they have to go into the business of keeping children's imaginations alive whether it's by serving as Santa or in this case, pulling fairy – instead of jury – duty. Already dubbed a “Tooth Fairy” on the ice as the “sideshow attraction” who goes out and smashes opponents teeth as a jaded minor league hockey player, Johnson's Derek Thompson gets a dose of the real thing shortly into the film when he's summoned to Fairyland by Julie Andrews for the crime of “Dissemination of Disbelief” aka killing the dreams of minors in his career and at home when he nearly tells the daughter of his girlfriend Carly (Ashley Judd) that there is no such thing as a tooth fairy after spending her money in a poker game. Given “amnesia dust” and other handy supplies by Billy Crystal in a nice comedic cameo, working from a screenplay co-written by his City Slickers scribes Lowell Ganz and Babaloo Mandel, Derek is sent out to collect teeth under the watchful guidance of wingless pencil pusher Tracy (Stephen Merchant). And soon he finds himself struggling to meet the demands of life as a bicuspid collector at night and a incisor remover on the ice while at the same time keeping his dual gig secret from his loving girlfriend and her two children. 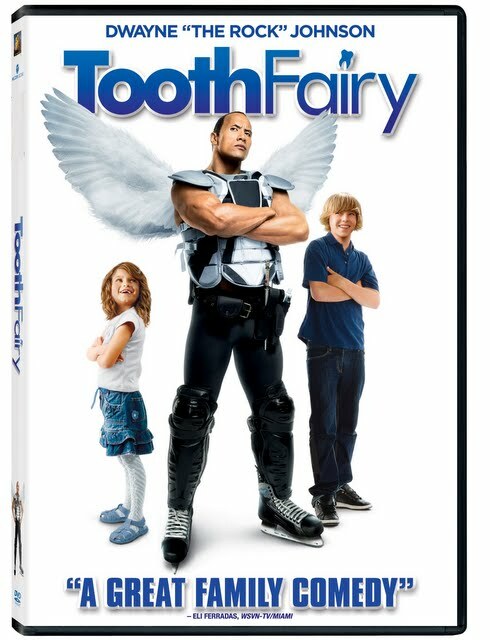 As a film, Tooth Fairy is filled with a number of sight gags that are sure to appeal to young children yet with enough likable humor supplied by its cheerful cast to keep parents interested. And as predictable as it is, even when you realize that the Tooth Fairy angle isn't working quite as well as the main plot of Derek and the family he loves along with his need to support and believe in dreams and imagination himself, it's still the type of Hollywood film that don't often get made much anymore. Likewise it's a hoot to see Julie Andrews and Billy Crystal even in roles as tiny as the ones they have, riffing about budget cuts in Fairyland since the two aren't used very much anymore, similar to my sheer delight at seeing Ricky Gervais' comedy partner Stephen Merchant in a role as substantial as playing sidekick to The Rock. Although four out of five dentists may disagree, I do think Tooth Fairy would've been better if it would've just played mild fantasy instead of going after another big event or familiar character in something along the lines of the Disney family fantasies of the '60s and '70s from Mary Poppins to Freaky Friday to The Computer Who Wore Tennis Shoes or even like Paramount's underrated Eddie Murphy gem from last year, Imagine That. And while I certainly hope that we won't see "The Easter Bunny" anytime soon, nonetheless, for children whom we still desperately do need to cling to the sweet things in childhood like believing in magic, one can do a lot worse than the smile-inducing Tooth Fairy that manages the perfect level of sweetness so as to cause chuckles instead of cavities.